Step 1 Get the plugin. Download the lite version for free from wordpress.org, or purchase a premium license. Fatal Error Notify will let you know whenever something on your site breaks. It will tell you which theme or plugin caused the error, which users were affected, and on what page the error occurred. Step 3 Make the world WordPress a better place. Allow anonymous data to be sent to ErrorWire. We’ll tabulate all of the error reports and let you know of any possible conflicts, before you install a new plugin or update your site. Take the uncertainty out of managing your WordPress sites. If something goes wrong, we’ll let you know. Select which type of alerts you’d like to receive. Get notified for every little bug, or just when your site completely crashes. 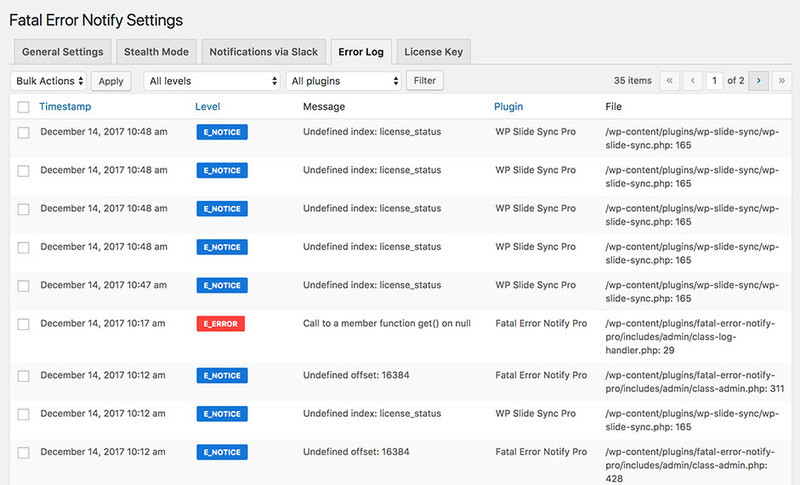 Error reports include a link to edit the offending file in the plugin / theme editor. Make a quick fix and get your site back online. 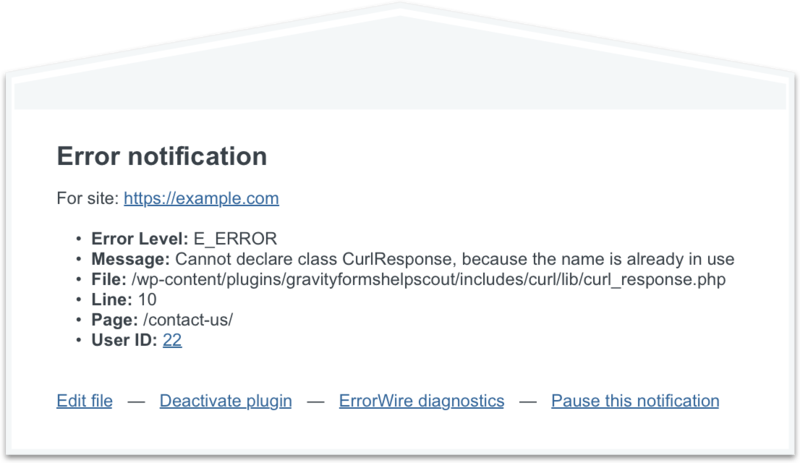 Access aggregated theme and plugin information on ErrorWire and check for known bugs and plugin conflicts. Prevent your clients from disabling or changing settings. Plugin will only be visible to selected administrators. If an update or new plugin takes the site offline, automatically deactivate it until it can be reviewed. Automatically post error messages and debugging information to a Slack channel of your choice. Save errors to a database table and search / filter by source and severity. Or export to CSV. Prevent installation or updates of plugins with known conflicts (from the ErrorWire database). See compatibility information, required PHP versions, and frequency of error reports from within the Add Plugins screen. 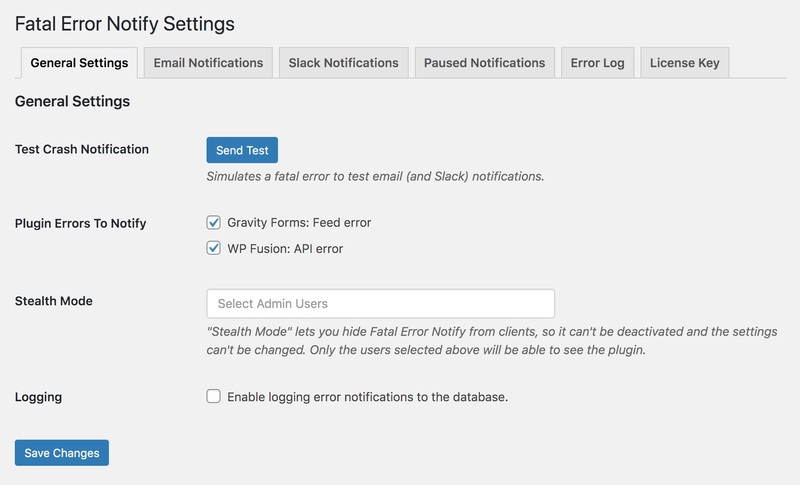 Whether it’s by email, Slack, or a custom webhook, Fatal Error Notify gives you the information you need to quickly resolve problems before your customers or clients even notice. Includes PHP classes you can bundle with your own themes or plugins, that will report back to your site with debugging information whenever your software causes a fatal error.